Chocolate. It's such a lovely, malleable substance. It can be shaped into anything really. Anything. But, one wonders what kind of twisted mind came up with this idea...chocolates shaped like kabutomushi (rhinocerous beetle) larvae! Avert your eyes if you are squeamish. You may not want to read this while you're eating. (If you're getting here from the front page, pause and breathe in deeply before clicking that 'continue reading'. If you're up to it, keep scrolling down. They look somehow uh, worse, in multiples. According to Yahoo! Japan News (Japanese), these were displayed at a 'regional products fair' at a department store in Akita, which is in northern Japan. They are made by a confectionery maker. They've been so popular at the fair that they've been selling out within an hour every day. 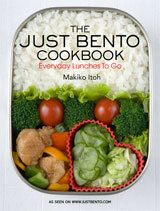 Apparently they have been a big hit because they are so kimo kawaii (a combination of kimochiwarui, or 'gross out!' and kawaii). As a matter of fact, according to the maker's website (Japanese of course), they have been so inundated with orders that people who order will receive the product after April. The larvae bodies are made of milk chocolate with crunchy 'flakes', covered with white chocolate, with dried cuttlefish (sakiika, a popular beer snack) for the legs and orange peel for the mouth. Each one is 4.5 cm (almost 2 inches) long. If these are too tame for you, they make them in an adult flavored version (with a rum-laced ganache). They also have some virulently colored potato grubs (imomushi), which are made of bean paste (an). Yes I know, Japanese people are weird. Kimokawaii! Submitted by maki on 2008-01-28 08:39. I must be a sick and twisted individual, but I think those are adorable! Thanks for sharing. I think it's ewww and cute at the same time. 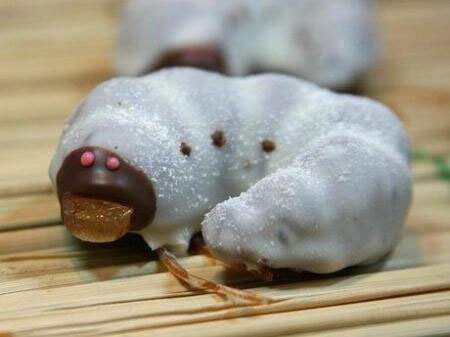 The Japanese do have a way of making things really interesting.....chocolate/sweets and larvae! Aww, but those aren't so weird! ...but I don't think I'd be very comfortable eating them. I know that they're chocolate, but it would still feel like I was eating a bug! I would absolutely not eat that chocolat because...yuck...cuttle fish...are they serious? Dried fish with milk chocolat..no way! I had the real things in Thailand, so I guess eating these little chocolate buggers won't be such a big deal.